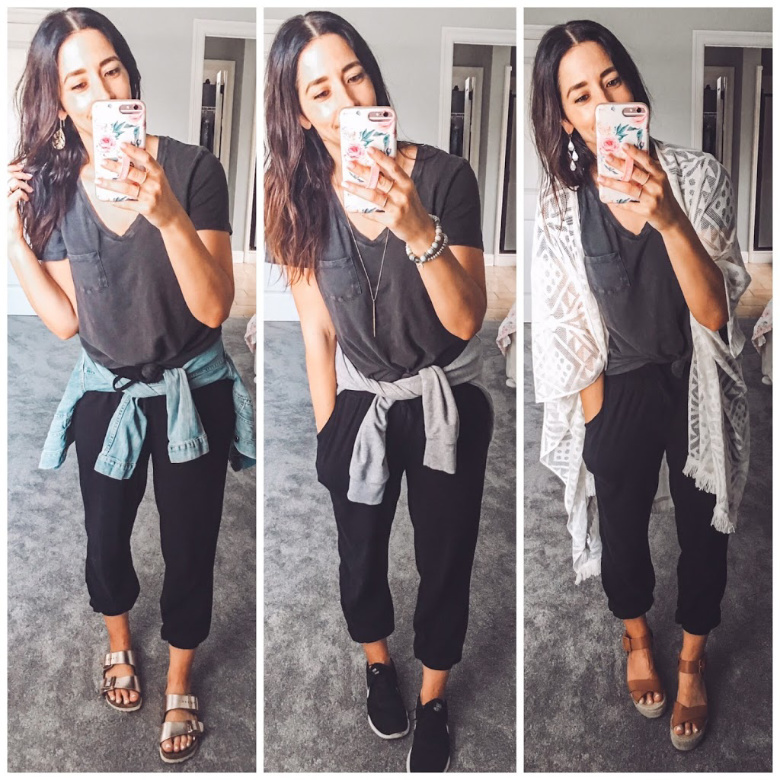 I styled these joggers 3 different ways over on Instastories, and I wanted to show it to you here, as well! These are a favorite of mine, they are butter soft, lightweight and really flattering. I wear them casually most of the time, but I wanted to show you a dressed up version as well! You’ll probably see me wearing this outfit, or a variation of it, over and over again. It is one of my uniforms (see guide below!) and just always works. I mean, these jeans and this tank are the best. BUT! Can we talk about these amazing turquoise beaded Anne Fringe earrings? They are so good! I’m also wearing the Delicate Petal necklace in gold, I put it on as soon as it came in and I haven’t taken it off. You can shop my Stella & Dot faves HERE! The kimono that you all loved last week, layered over the best denim shorts (they are midi length! ), and that tank again lol. I bought these overall shorts last year (similar look here) and love how they add a little fun into my mostly very simple wardrobe. I also love these a little dressed up, too, with wedges and a cute, off the shoulder bodysuit! And now onto my best sellers of the week! These are the things you purchased the most through my links. I love seeing what resonates with you, it helps me create great content for you! These Petal Hoop earrings in gold! I loooove these and wore them about 4 times this week already myself. These under $20 Target white slides! They are a dupe for the more expensive Steve Madden ones and I think are just as nice. This Universal Thread cardigan from Target (I own it in 2 colors!) 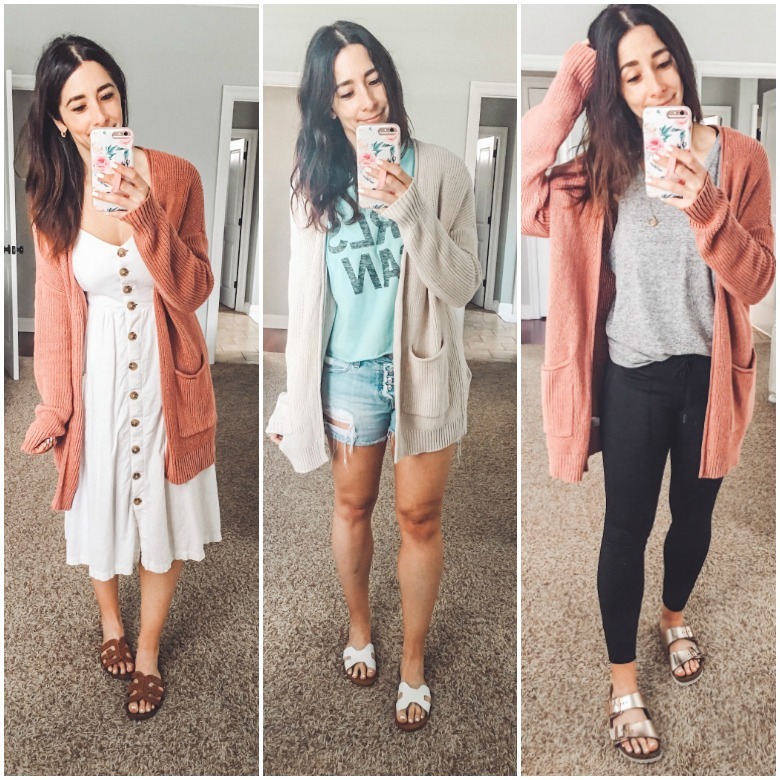 It is the perfect Spring/Summer weight cardigan and fits like a boyfriend cardigan. I have it in small. And my rose gold Birk’s! These were an investment for me last year, but were so worth it. 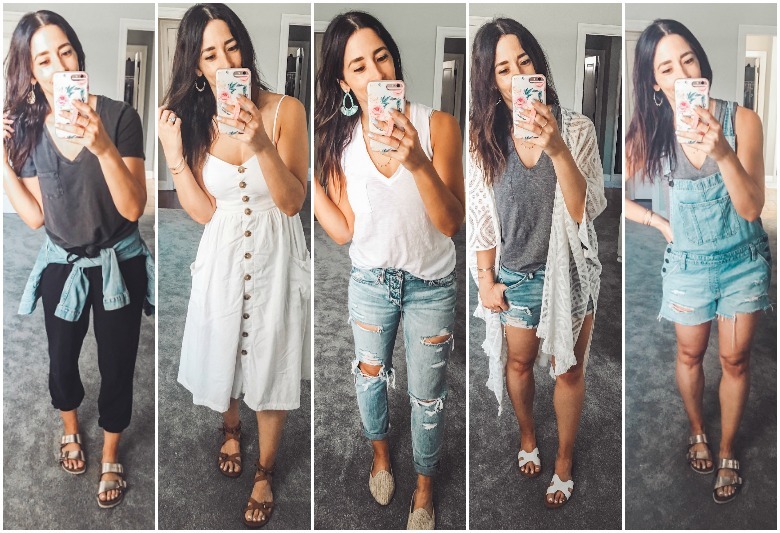 I wear them every single weekend and they make all outfits better. That’s it! I hope you all have a GREAT week! 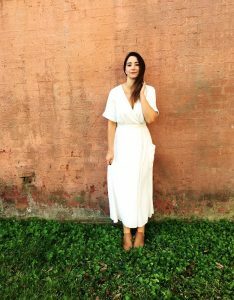 Don’t forget to grab my FREE guide below, it helps you create uniforms for your daily dressing and streamlines the “getting dressed” process!